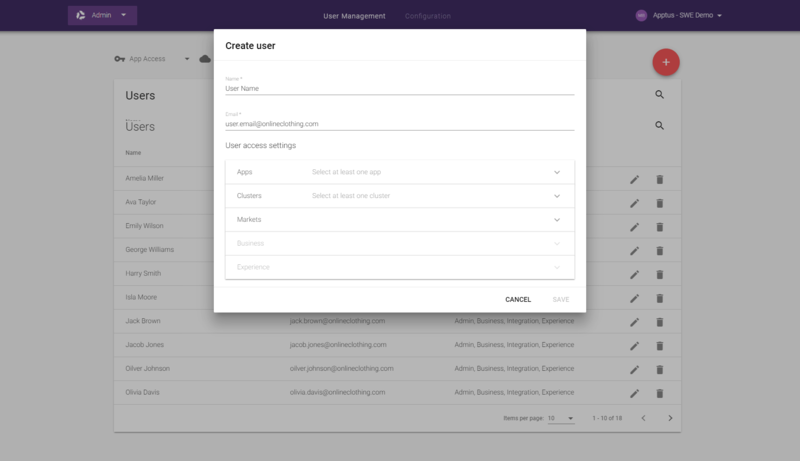 The Admin app is where an administrator can manage users, access rights to apps and markets, as well as system configuration for locales, market currencies, and more. The user management tab is where an administrator can add, remove, and edit user information and access. 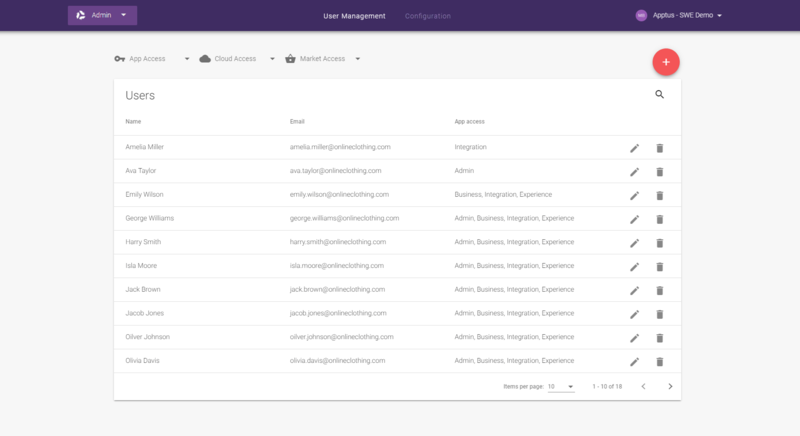 All users must have a valid name and email address, and have access to at least one app (Business, Experience, Integration, and/or Admin), one cluster (as configured by Apptus), and at least one market. Additional user access settings for specific apps is managed within the user access dialogue window. For the Business app, access to the Exposure Strategies view and the Promotions view can be selected. For the Experience app, access to edit synonyms worldwide (for all markets) can be selected. Email The email address of the user. An invitation to the apps will be sent to the user via email when their account is created. Apps The apps the user will have access to. Current apps are Business, Experience, Integration, and Admin. Clusters The clusters the user will have access to and use the apps in. The clusters are selected from a list of available clusters for the retailer in eSales. Markets The markets the user will have access to and use the apps in. The markets are selected from a list of available markets. Business Additional settings for users with access to the Business app. Access for a user to the Exposure strategy and Promotions views is set here. Experience Additional settings for users with access to the Experience app. Access for a user to edit synonyms worldwide is set here. 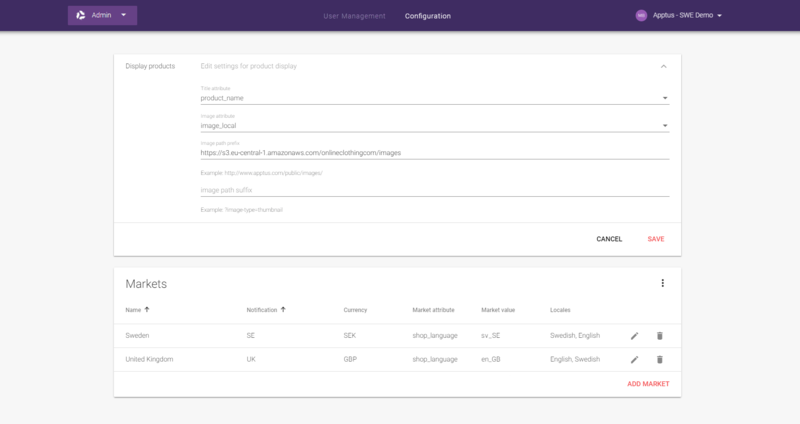 The configuration tab includes settings for product display and markets. The display products controls what attributes are used for products and images. The attributes for title and image are selected from a list of the available and configured attributes. These settings are necessary for Apptus eSales to get correct access to the retailers product database in order to display product images, product descriptions, and attributes. Title attribute The attribute used to display the name of a product. The attribute is selected from a list of available attributes in eSales. Image attribute The attribute used for the file name of a product image. The attribute is selected from a list of available attributes in eSales. Image path prefix The path from where product images are fetched. The image path prefix is entered manually. Image path suffix The image path suffix is an optional addition to the full image URL. The image path suffix is entered manually. The markets configuration controls which attributes that are used with a market including currency and locales. The settings for market and locales are also used and available in the other Apptus eSales apps, e.g. the Synonyms tab in the Experience app and in the user management tab in the Admin app. Locales are added automatically if included in an Import and can be added manually by entering a language code and a display name. Name The name of the market. Notification The identifier included in all notifications sent to eSales for the market. It is not recommended to change the notification identifier. Currency The currency used for the market. Market attribute The attribute that eSales will use to determine what market to use. The attribute is selected from a list of available attributes in eSales. The attribute should not be changed. Market attribute value The value of the market attribute for the current market. The attribute value is entered manually and should not be changed. Locale The language settings used for the market. The attribute is either selected from a list of available locales or can be added as a custom locale including a language code and a region identifier.